SACRAMENTO, CA – Global music icon, multiple GRAMMY® Award-winner and multi-platinum selling artist, the incomparable JANET JACKSON, will embark on a four-month North American tour this fall, announced today, which includes a stop in Sacramento on Tuesday, October 3 at Golden 1 Center. Tickets are $125.00, $99.50, $69.50, $49.50 and and $29.50 for reserved seating. This show was cancelled for Sleep Train Arena in the summer of 2016, and guests will need to buy new seats for this show at Golden 1 Center. Tickets for Sleep Train Arena will not be valid for this show. Produced by Live Nation, the STATE OF THE WORLD tour is set for a 56-city run beginning September 7, in Lafayette at the Cajundome. The legendary entertainer began her sold out Unbreakable tour in August 2015, but just one year ago she reached out directly to fans via Twitter with news of her focusing on starting a family, confirmed months later with the arrival of her first child. Since, she has taken the past year to enjoy pregnancy and motherhood, and is now ready to return to the live stage to give Janet fans everything they could hope for in one epic concert event. The STATE OF THE WORLD tour is a continuation of the Unbreakable tour and will include fan favorites from her chart-topping 'Unbreakable' album, an array of her socially conscious music she's released throughout her career, and other smash hits and soon-to-be released new tracks with a state of the art live production! Janet Jackson is one of the most influential entertainers of the modern era. Her music has won her six GRAMMY® Awards, two Emmy Awards, a Golden Globe Award, a nomination for an Academy Award along with dozens of American Music Awards, MTV Video Music Awards and Billboard Music Awards. She has received accolades as an actress as well including the NAACP Best Supporting Actor award. Janet is a published author, dancer, businessperson, philanthropist and one of biggest-selling artists in popular music history. With sales of over 160 million records worldwide, Janet Jackson stands as one of the best-selling artists of all time with a string of hits that have left an indelible impression on pop culture. Her music and artistry has opened doors through which other top artists have followed, many acknowledging her impact on their musical perceptions. 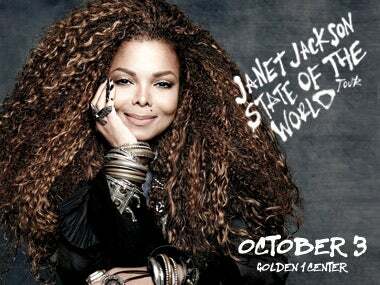 For more information please visit http://www.janetjackson.com. Live Nation Entertainment (NYSE: LYV) is the world's leading live entertainment company comprised of global market leaders: Ticketmaster, Live Nation Concerts, Live Nation Advertising & Sponsorship and Artist Nation Management. For additional information, visit www.livenationentertainment.com.